Ever Wonder What It Feels Like to Be Filthy Rich? You Can Find Out With The World of Hyatt Credit Card’s Bonus! If you’re looking for free nights in 5-star luxury hotels, here is the golden ticket. The new World of Hyatt Credit Card comes with up to 50,000 bonus Hyatt points after meeting tiered minimum spending requirements. That’s a flabbergasting amount of Hyatt points, and enough for 2 nights at top-notch hotels like the Park Hyatt Maldives. Or you can stretch the points for 10 nights at less expensive hotels, like the Hyatt Regency Bali. Hyatt points go further than most other hotel points. My wife and I have used Hyatt points to save on fantastic stays at terrific hotels around the world, including the Andaz West Hollywood, Andaz Amsterdam, Park Hyatt Sydney, and several others! You can apply for The World of Hyatt Credit Card here. 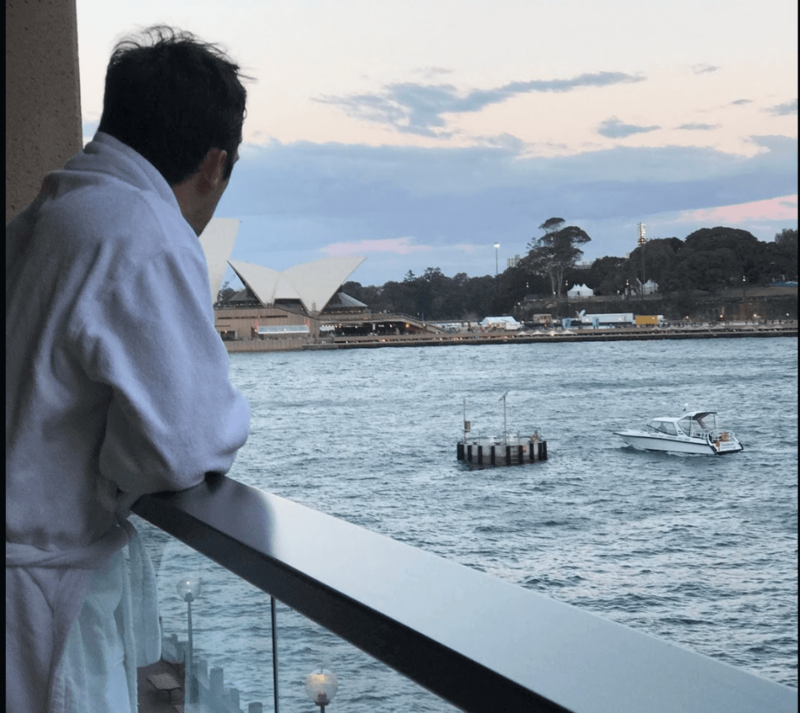 Being a Chase Hyatt Cardholder Got Me Automatic Elite Status and an Opera House View Room Upgrade at the Park Hyatt Sydney! If you’re looking to earn points for free Hyatt stays, you can do well with The World of Hyatt Credit Card. My wife and I both have the previous (and less fancy) version of this card. We think it’s worth keeping, even without these new and improved benefits! Here’s our full Hyatt credit card review! Hyatt has no blackout dates. As long as a standard room is available, you can book using points! Note: The World of Hyatt Credit Card is impacted by the Chase “5/24” rule. So if you’ve opened 5+ credit cards from any bank (excluding certain business credit cards) in the past 24 months, you likely won’t be approved for the card. With The World of Hyatt Credit Card, you can earn up to 50,000 Hyatt points after meeting tiered minimum spending requirements. 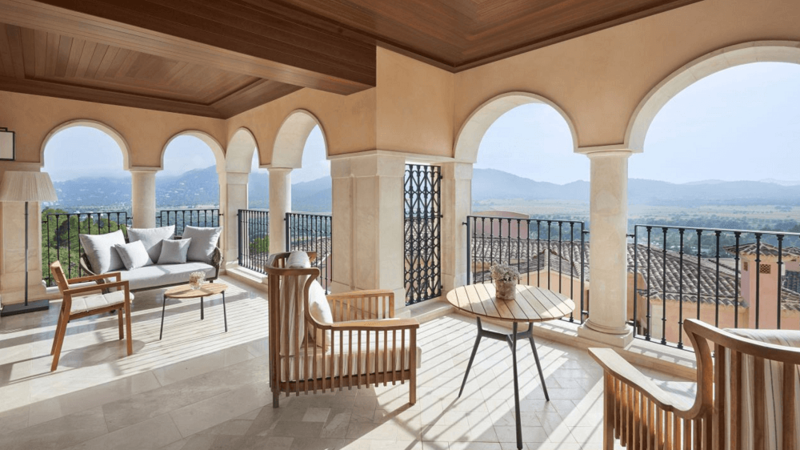 50,000 Hyatt points is more than enough for 2 free nights at the Park Hyatt Mallorca. That same stay could easily cost ~$1,200 in cash! Or you could use the bonus for up to 5 free nights at a lower category hotel, like the highly rated Hyatt Place St. Paul/Downtown, which costs 8,000 Hyatt points per night. This card is a no-brainer to use at Hyatt hotels. But there are better cards to use for restaurants and hotel stays, like the Chase Sapphire Reserve. What Can You Do With 50,000 Hyatt Points? One of the best parts about collecting Hyatt points is the chain has no blackout dates! 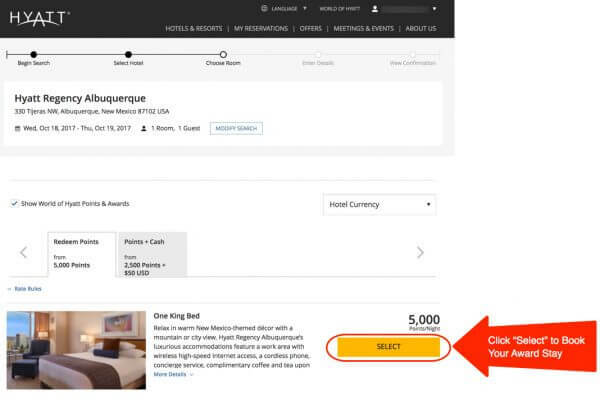 As long as a standard room is available, you can book using points. 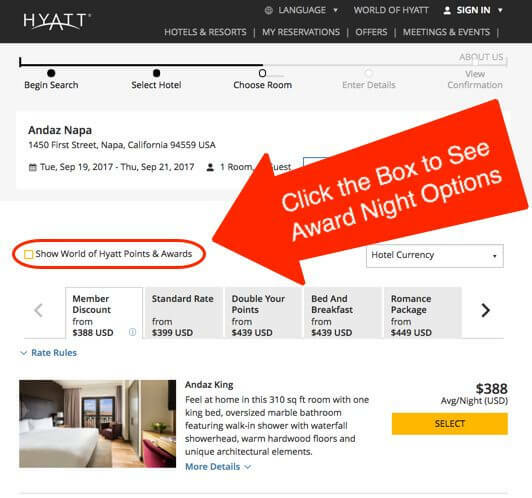 Plus, you’ll NEVER pay a resort fee when you book an award night at Hyatt hotels. 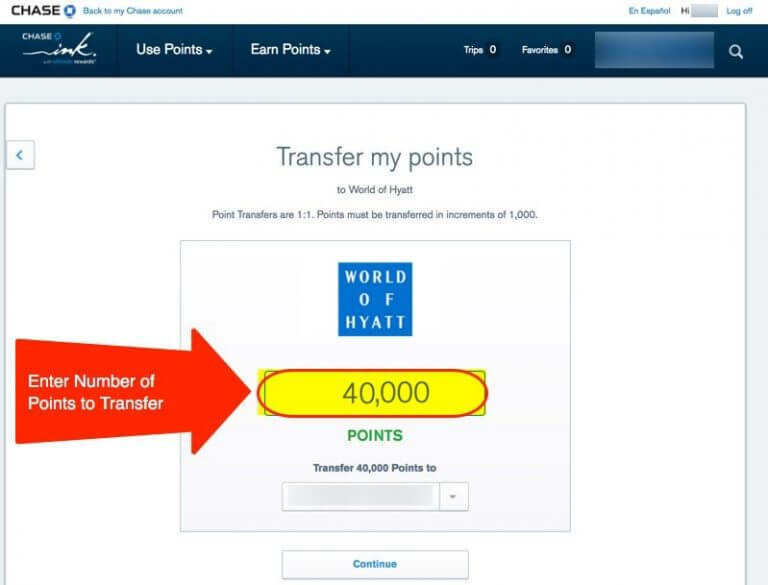 Here are 3 ways you can redeem points from The World of Hyatt Credit Card sign-up bonus. Folks looking for an all-inclusive getaway can use 50,000 Hyatt points to book 2 free nights at the Hyatt Ziva Los Cabos. A similar 2-night stay could cost $1,000+ if you paid cash, so using points is a great way to save money! My mom enjoyed a 4-night stay at this hotel. And it gets excellent reviews on TripAdvisor! You Can Even Use Hyatt Points to Book Free Nights at Their All-Inclusive Hotels, Like the Highly Rated Hyatt Ziva Los Cabos! 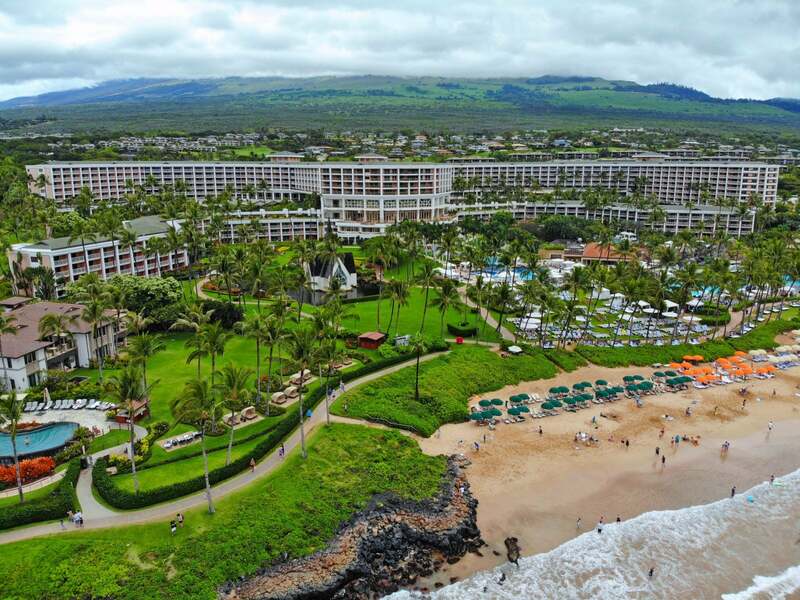 To book a room with points at this resort, you must call Hyatt at 800-228-3360. Note: The standard room cost is for 2 adults. You can bring up to 2 additional guests for 10,000 Hyatt points per person per night. And you do NOT have to pay for children under 3 years old. If you’re looking to explore fun nightlife and terrific restaurants, you can redeem 50,000 Hyatt points to stay 3 nights at the Andaz West Hollywood in Los Angeles. This hotel is only a ~5 minute drive from well-known attractions, like Runyon Canyon Park, which is a very popular hiking spot. And it’s close to shopping and entertainment on Melrose Avenue. 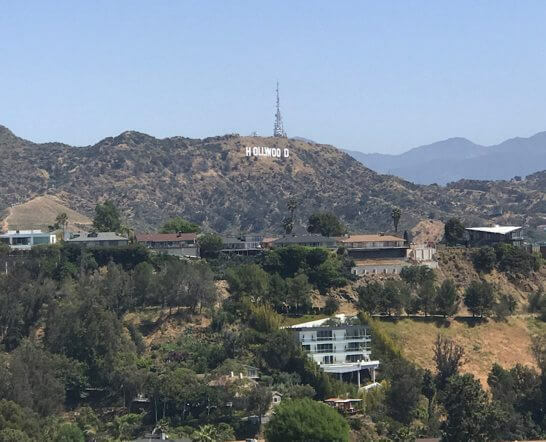 At the Andaz West Hollywood, You’re Only a ~5 Minute Drive From Runyon Canyon Park, Which Has Amazing Views of the Famous Hollywood Sign! If you’re planning ahead for a trip to New York City, you can redeem points at Hyatt Place Long Island City. This is the newest Hyatt hotel in the New York City area. The 50,000-point sign-up bonus is enough for 4 free nights at the Hyatt Place Long Island City. Don’t forget, all guests enjoy free breakfast at Hyatt Place hotels when they book directly with Hyatt. This hotel is just 2 blocks from Queens Plaza where you can get a subway to Manhattan. And it’s only a ~15 minute subway ride to Times Square! Folks Looking to Stay in New York City Can Stay 5 Nights at the Hyatt Place Long Island City, Which Is Just a ~15 Minute Subway Ride From Times Square! Don’t forget to check out our post with tips & tricks to save on a trip to New York City! The World of Hyatt Credit Card comes with plenty of benefits that are great whether or not you often find yourself at a Hyatt hotel. Here’s what you can expect! You’ll receive 1 free night each anniversary year at a category 1 to 4 Hyatt hotel or resort. And an additional free night at a category 1 to 4 Hyatt hotel or resort after spending $15,000 in an anniversary year. Depending on where you stay, each night could save you $250+! You’ll receive automatic Hyatt Discoverist Status with the card. It comes with perks like more bonus points per stay, upgrades to a preferred room based on availability at check-in, late check-out upon request, etc. As a cardholder, you’ll earn 5 qualifying night credits every year and 2 qualifying night credits after every $5,000 you spend on the card. So you can reach a high level of elite status more easily! In fact, if you’re a big spender, you could spend your way to the fancy Hyatt Globalist status without staying a single night at Hyatt! This card has a $95 annual fee. But the free night at a category 1 to 4 Hyatt each cardmember anniversary can easily offset the annual fee. It’s a great reason to keep the card open year after year! For example, you can use the annual free night certificate to save $250+ on a stay at the Hyatt Regency Monterey Hotel & Spa On Del Monte Golf Course. We stayed at this hotel earlier this year and it was perfect for sightseeing along the Pacific Coast Highway. Use the Hyatt Free Night Certificate to Stay in Monterey! 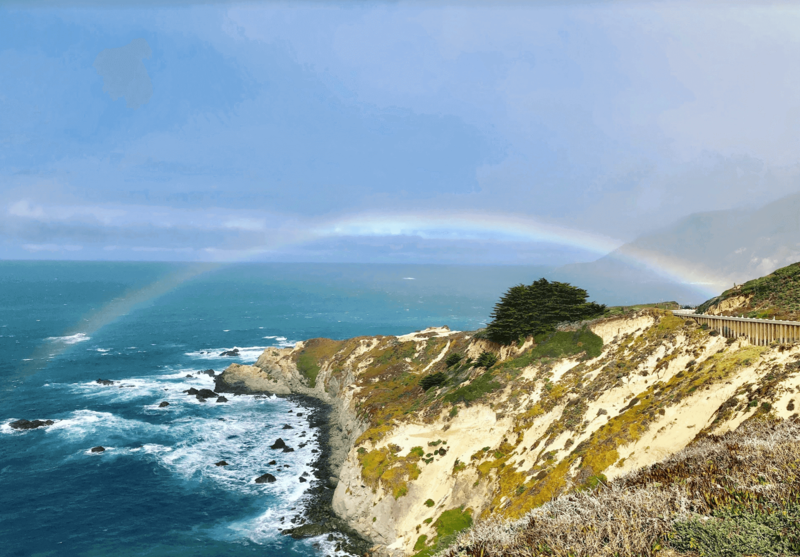 You’ll Catch a Glimpse of Beautiful Views Driving Along the Pacific Coast Highway! 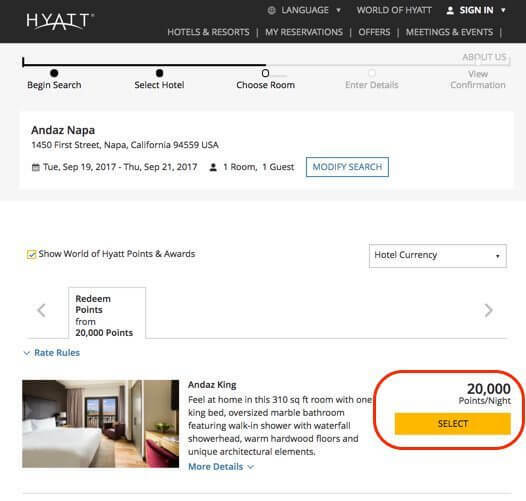 Does the World of Hyatt Credit Card Have a Foreign Transaction Fee? 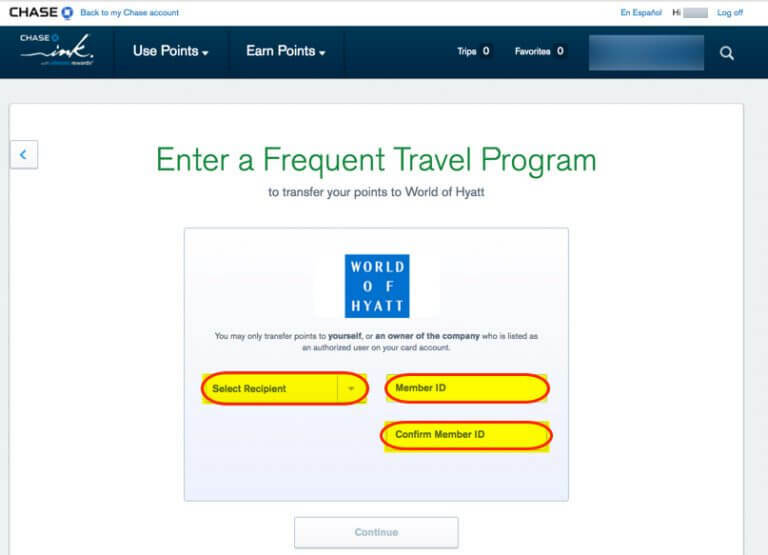 Who Is Eligible for the World of Hyatt Credit Card? The World of Hyatt Credit Card is affected by the Chase “5/24 rule”. So if you’ve opened 5 or more cards in the past 24 months, it’s unlikely you’ll be approved for the card. You can earn Chase Ultimate Rewards points to use for free Hyatt stays with lots of great credit cards, because Hyatt is a Chase Ultimate Rewards transfer partner. I’ll share 3 options! Just keep in mind this card is also impacted by Chase’s stricter application rules. So if you’ve opened 5+ cards from any bank (except Chase business cards and certain other business cards) in the past 24 months, it’s unlikely you’ll be approved. 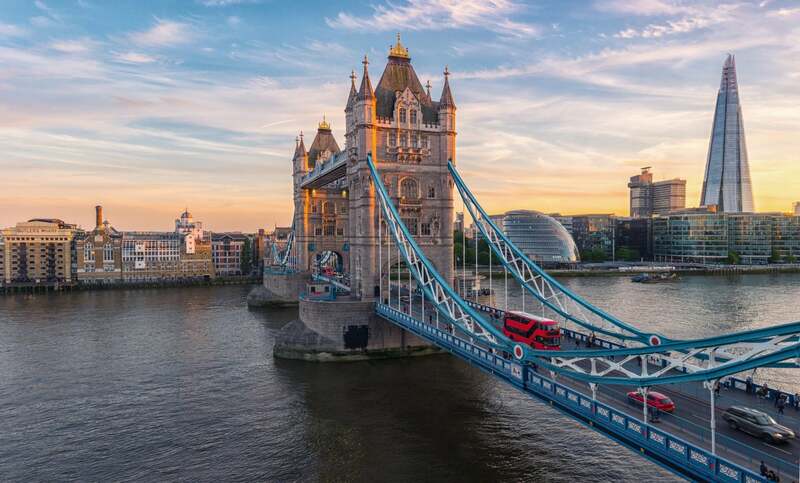 When you open the Chase Sapphire Preferred card, you’ll earn 60,000 Chase Ultimate Rewards points after you spend $4,000 on purchases in the first 3 months from account opening. The Chase Sapphire Reserve gets the most use among the cards in my wallet. I love earning bonus points for travel & dining purchases! And if you have a no-annual-fee card like the Chase Freedom, Chase Freedom Unlimited, Ink Business Unlimited, or Ink Business Cash Credit Card, you can move points to an eligible Chase Ultimate Rewards account that allows you to transfer them directly to Hyatt at a 1:1 ratio. And keep in mind, you can NOT book award stays at Hyatt’s all-inclusive hotels online. 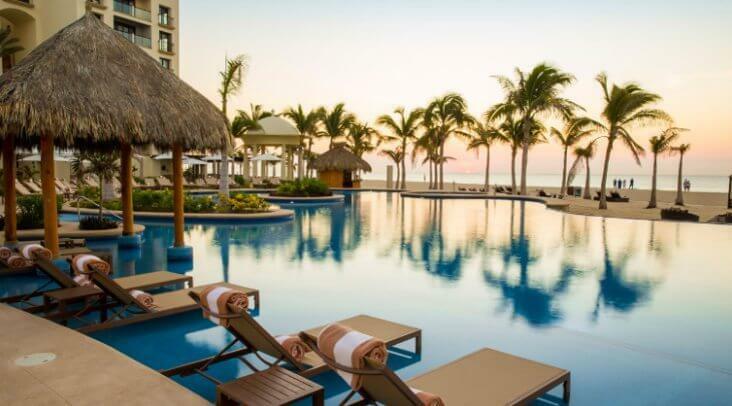 You must call Hyatt to book a room at an all-inclusive resorts like the Hyatt Ziva Los Cabos. Although it’s an extra step, it’s worth it to save money on a fantastic stay! Remember to check the hotel’s cancellation policy when booking. If you have to cancel within the eligible time frame, you’ll get the points back into your account. The World of Hyatt Credit Card comes with up to 50,000 Hyatt points after meeting tiered minimum spending requirements. It’s an outstanding card for folks who like luxury hotel stays in beautiful destinations. Hyatt doesn’t have many hotels, so if you like road-tripping or staying in small towns, you probably won’t get much use from Hyatt points. But if you dream of staying in 5-star glam, you can’t get much better than this card. For example, using 50,000 Hyatt points can save you ~$1,200+ on a 2-night stay at the Park Hyatt Mallorca. With tons of points to spare! 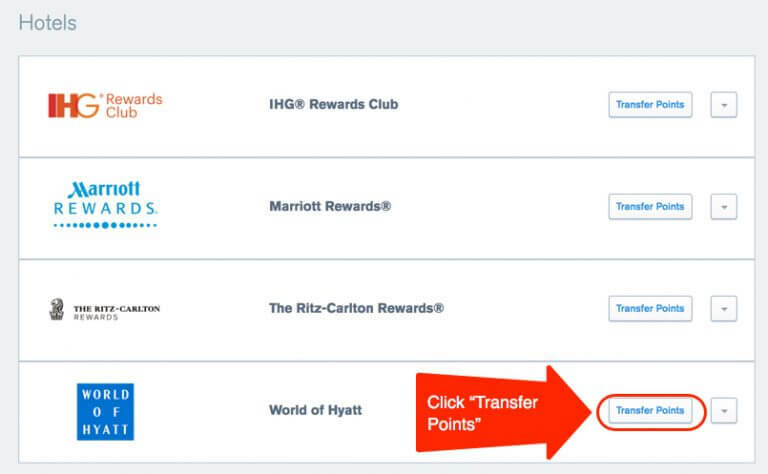 Remember, you can transfer Chase Ultimate Rewards points directly to Hyatt. One of the best parts about using Hyatt points is that there are no blackout dates. If you find a standard room available for sale, you can book it using points! And you NEVER pay a resort fee when you book an award night at Hyatt hotels.